I am not sure why, but installing cabinets in our DIY kitchen renovation really intimidated me. I thought it was going to be really difficult to line them up, make sure they are level, etc. We realized though that installing kitchen cabinets yourself is actually pretty simple. Here are a few tricks we learned while installing ours. We used a stud finder to locate each stud and then drew a vertical line down the wall. Drilling your cabinets into a stud is vital and will provide the much needed support your upper and lower cabinets will need. Map out the layout for the cabinets before you start installing. Mark where each cabinet will begin and end. This makes installation go a lot smoother and faster as there are no questions on placement. Does holding an upper cabinet while screwing it into the wall sound like a nightmare? You're right - it would be! Take some of the heavy lifting out of the equation by installing a ledger board (a small strip of lumber) into the studs. The weight of the upper cabinet can rest on this board while you focus on attaching it to the wall. The pros may have a different opinion on this, but installing the uppers first worked well for us. You have more working space underneath the cabinets. You want to make sure your cabinets are 100% level. Do you want an apple rolling off of your new kitchen counters? Didn't think so. Before each cabinet is attached to the wall, make sure it is level. Use shims to adjust the height on each side and invest in a long level to make sure everything is flat. Brian pre-drilled small holes into the cabinets once we knew the placement of the screws. This helped to lessen the chance of splitting the cabinet finish or stripping a screw. For a more finished look, he used small screws to attach cabinet faces together. This reduced the appearance of seams and made the kitchen cabinets look more professional. There is a lot of movement when installing cabinets. Doors are swinging, shelves are falling. I think it helps prevent damage and dings if you leave the plastic covering on the cabinet faces until installation is complete. Click here to see the complete before and after of our budget-friendly kitchen renovation. If you have a game plan and the right tools, installing kitchen cabinets is an easy DIY project to help keep your budget on track. 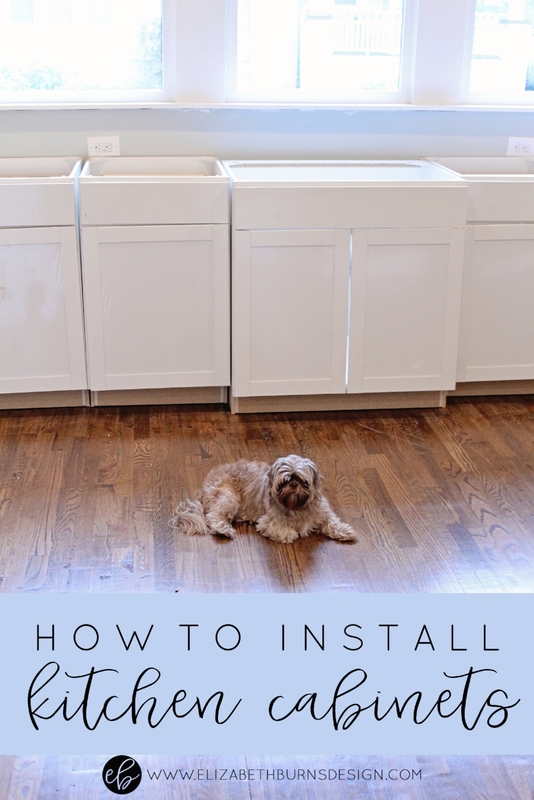 Have you installed cabinets before? Any advice?